H5N8 avian flu has been confirmed in a dead wild swan near Lough Beg, Co Londonderry. It came as the first bird flu case in Northern Ireland just days after the Department of Agriculture, Environment and Rural Affairs (DAERA) extended its AI prevention zone to March 16 due to the ’increased risk of avian influenza in the UK’. The case closely followed the latest outbreak at Wyre, north west of Preston, which was confirmed on Monday (January 30) and came only days after discovery of the disease at a Bernard Matthews turkey rearing farm near Boston, Lincolnshire (January 26) and a second case in Lancashire (January 27). All three cases in Lancashire are linked to the same game farm and it is understood 63,000 birds will be culled as a precaution. 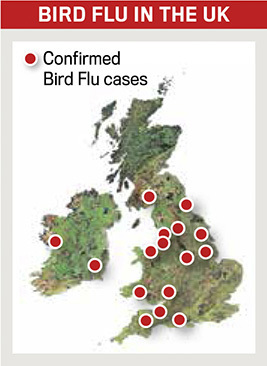 There have also been two confirmed cases among wild birds in the Republic of Ireland in the last six weeks. In a statement, DAERA chief veterinary officer Robert Huey said: "This finding is not unexpected and follows calls for bird keepers to be more vigilant for signs of the disease. "It is possible that more cases will be confirmed." All poultry keepers have been urged to comply with the legal obligation of the housing order until February 28. Ulster Farmers' Union poultry chairman Tom Forgrave added: “Whether your poultry flock is large or small, please ensure that all biosecurity measures are in place and are as robust as possible to protect the health of the flock. “Given the spread of the disease in wild birds, flock owners must continue to comply with the Avian Influenza Prevention Zone, which requires that all poultry and captive birds in Northern Ireland be kept indoors, or otherwise kept separate from wild birds."